John studied architecture at Cambridge University and in his early career taught at the universities of East London, Brookes Oxford and De Montfort. He formed Avanti Architects with four colleagues in 1982. After twenty years at Avanti, John joined Anschen and Allen. In seven years John directed twelve major projects. These span the full range of health care from complex tertiary hospitals for oncology, paediatrics and maternity to innovative community facilities. He has completed designs for new types of hospitals which have 100% single rooms, migrating many of their ambulatory services into the community. He has worked in Ireland, Norway, and Australia and collaborated with his colleagues in the USA. John is the current Chair of AfH. Patrick Hutt is a newly qualified GP who has written extensively on General Practice. He is author of Confronting an ill Society, a biography of David Widgery, a radical East End GP. At University College London he is currently researching the evidence for differing health centre configurations, motivated by the recent proposals for polyclinics. He is Junior Editor of InnovAIT – the journal for GP trainees. He lives in and is from Hackney. Thomas Gardner is currently project architect and key Sustainability Group member at Allford Hall Monaghan Morris, following work for Urban Salon, Meadowcroft Griffin and Wilkinson Eyre. He has wide project experience, including leading the completion of Sunshine House, an RIBA award-winning Child Healthcare centre in Southwark. He is a studio teacher at Cambridge University, and has previously won an RIBA East student award. He and his work have featured in journals including Building Design and the Guardian. Born in Aberdeenshire; qualified (Bachelor of Architecture), Mackintosh School of Architecture Glasgow School of Art 2001. Worked 4 years as an architectural assistant in practice for Dunwoodie Architecture and Design, where the interest in Healthcare design emerged. Qualified (B.Arch) University of Newcastle Upon Tyne 2008, Children’s Language and Speech Clinic won the Architects for Health Student Award 2008. Current projects include the redevelopment of South Tyneside District Hospital Accident and Emergency Services, whilst undertaking Part 3. After graduating from London Metropolitan University in 2004, she joined Cottrell & Vermeulen Architecture. 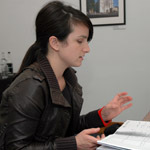 Francesca maintains strong links with the university and is currently a co-tutor for a Post-Graduate Unit and qualified for the RIBA Part III in 2006.